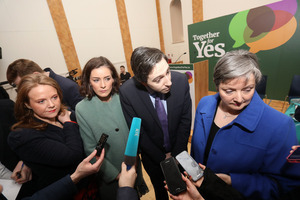 The launch of the cross party Eight Amendment ‘Together for Yes Campaign’ lwith , above, from left: Fine Gael Minister for Health Simon Harris with Fine Gael TD Katie O Connell, Senator Catherine Noone and Marcella Corcoran Kennedy and (pic 2) Sinn Féin President Mary Lou McDonald. 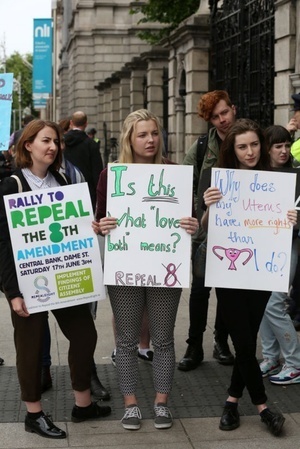 The Rotunda Hospital has distanced itself from the launch of the pro-repeal Together for Yes campaign at the hospital’s Pillar Room on Thursday, insisting it “does not support any political organisation or agenda”. 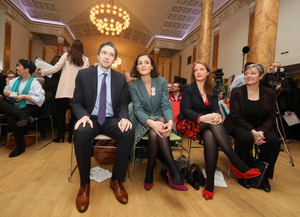 Pro Life Campaign spokeswoman Dr Ruth Cullen described as “crass and insensitive” the decision of the group to launch its campaign at the Rotunda, which describes itself as one of the busiest maternity hospitals in Europe. Posted in Misc and tagged The Eighth Amendment at 11:47 am on March 22, 2018 by Bodger. She didn’t. They’re just pretending to be bezzies with her. Like when I call you sir. Of course you have a smoking jacket. I think his jacket just sometimes goes on fire. Ok. I’ll call you BB/OTB instead, as requested. Which is hella cool. lol yea.. katie? its also too cutesie a name for such a hard nosed, heartless woman. she would absolutely get it tho. there’d be a bit of hate in it, but sure how n ever. But he has a double halo. Why on Earth did the rotunda agree to it being there in the first place? Methinks a bit of background shenanigans is afoot. Responding to queries from The Irish Times, a spokesman for the Rotunda Hospital said the room was managed by a foundation that was entirely separate from the hospital. “The Pillar Room is fully operated and managed by the Rotunda Foundation, ” he said. “The Rotunda Foundation is completely independent of the Rotunda Hospital with its own separate board and executive. Should have set up a toll booth on the route to it. So being that entity its exempt from accountability? The Pillar Room, where this event took place, is entirely separate to the hospital and run by a completely independent body. It is an odd choice of venue alright. Launching a campaign for abortion at (albeit not in) a maternity hospital. No it’s not, and you know it’s not. Save the unborn maternity hospitals! Take your logic elsewhere, we need it not here. or you could think of it as treating all women who require neo-natal services in the one place of expertise. there, that’s not creepy or vile is it? With all due respect dave, I think you’d actually have to experience the services first hand to know. Women who experience still births, or complications in their pregnancy, or have to have a d&c would all be treated in a maternity hospital, just as any other pregnant woman would be treated for a complication-free pregnancy. Additionally, the rotunda also deal with other routine gynecological issues and surgeries, like removal of cysts for example. only in your head david, only in your head. Abortion is the opposite of pregnancy though. It’s a little insensitive imho. There are women in that hospital today who’s babies have died before delivery. And the campaign being launched on the campus is specifically to facilitate the death of babies before successful delivery. You make it sound like they’re going in with hangers at 39 weeks. There are women in that hospital who respect other women’s right to choose whether to go through with a pregnancy or not, regardless of the outcome of their own pregnancy. Mental about not ending human life, yes. But ok with women dying and 12 year old mammies. Well I guess that law is working out just fine then. Start a campaign for women who have miscarriages to get treatment in a separate area of the hospital if you actually care about their experiences. I think the current situation, where they are kept in an area with newborn babies (at least in UHG) is infinitely more cruel than having the knowledge that somewhere in the premises an abortion could be happening. Which probably wouldn’t feature at all really. Aye. It’s not massively pleasant when you’ve just had a D&C to listen to the cries of newborn babies. same with the sexual assault treatment unit (also in the rotunda). you have women who’ve just been raped seated in a waiting room beside someone with balloons and teddy bears offering them an eclair. just all a bit insensitive. david I thought you said you were considering voting repeal once you knew what it would be replaced with? If you look closely David likes to say he supports a thing and then viciously attack that thing, like Repeal the 8th, and Ireland. So out of spite over “the crap coming out of the repeal mob” you’ll deny women bodily autonomy? To hell with the issue at hand, play the man not the ball? You’re such a sensitive soul newsy. Ireland preforms a fair few abortions a year – all of them take place in maternity hospitals. Do you want them to be carried out in a disused garage in some secret industrial estate by a shady bloke named Gary or something? Grow up and stop being so bloody disingenuous. It’s not the necessary (and legal) abortions that take place in maternity hospitals I’m talking about. It’s the launch of a political campaign to support abortion, taking place in a maternity hospital that I think is a bit off. It wasn’t exactly in the hospital though. It was in a separate building behind the Gate theatre. Yet pictures of aborted (or, more likely, miscarried) fetuses blown up on huge billboards in public spaces where pregnant women or women who have experienced miscarriages can see them are okay. I’m almost sure the Yes Equality campaign launch for the marriage ref was held there? Its a media friendly, central location, clearly. The whining about mentioning the fate of babies with Down Syndrome in other jurisdictions and showing the physical reality of dead foetuses spring to mind. Let’s just agree there’ll probably be whining on both sides. Obviously these external factors should be used to abridge the personal freedom and bodily autonomy of women. senator noone and deputy oconnell the liberal face of the right wing and attractive too. Can we try a little harder please BS? It’s been a rough week in the Towers. Maybe we ought to cut them a little slack? Simon Harris gives me the creeps. Needs a tan or something. I would say a good rogg? 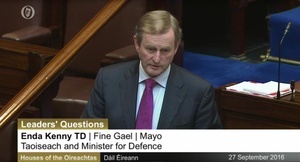 Irish people always look way older than they are. They also have very mean mouths. A Frenchboy lost in Dublin wants to know. Though whatever it is, I’m not going to respond as you are quite rude. We’re gawjiss. I want to know why you Irish have very thin lips and I want to know why you age badly. It is the diet or it is no sun? Frenchboy: Why did France capitulate so easily in two world wars. No backbone I’d say. Damn your good skin and pouty lips. I went out with a french boy once. He had a beautiful mouth and glorious cheekbones, but no personality. Such a pity. No need to be bitter. It was a long time ago now. What was Ireland role in WW2 ? Why don’t you tell us all about Portugal’s capitulation during WWII. Take your time reading Wikipedia first though. He offered condolences with his mean lips? non ? Repealing the 8th means more than access to abortion. It’s about ensuring that women who are pregnant have full, informed consent throughout their pregnancy. No more obstetric violence No more threats of high court action against 9 month pregnant women who have the temerity to challenge the obstetrician who wants the birth to be hurried up because they have other things to do! You’ve clearly never actually gone through labour with a medical team around you telling you that you’re not dialating fast enough. 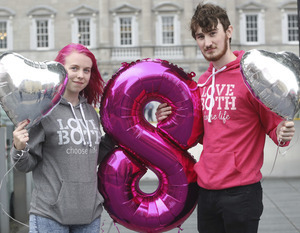 Repealing the 8th is about ripping out a growing human, called it a foetus if you want to make yourself feel better about it though. A foetus is the state between conception and approximately 12 weeks. After that point it begins to develop into a baby, in that it has the potential to become an infant, a life that can survive outside of the womb. Which takes time obviously. However, before that point – in week 1-12, it is in fact a foetus. Which, if the referendum passes, will be the aim of future legislation. Abortion up to 12 weeks. Correction. I’ll rephrase my comment seeing as I wrote it out entirely wrong. The stage between conception is the embryonic state. From 12 weeks to birth is when it is known as the foetus. So, Daisy is absolutely correct in using the term. However with regard to the referendum, legislation will only allow for abortion meaning that most abortions will take place in the embryonic state. What’s the difference between an unborn human at 11 weeks and 3 days and 12 weeks 2 days? It must be a huge, startlingly obvious and profound difference, given you are suggesting it is defensible to abort it at 11w3d but not at 12w2d. We’ve had this discussion before. I’m not rehashing it for you. And supposing the foetus is diagnosed at 26 weeks having fatal foetal abnormality what then? Then it is between a woman and her doctor. It has nothing to do with you or me. And also, still a foetus under those conditions. Not a baby. The ballot paper won’t go into specifics as the referendum is about taking the issue out of the constitution and handing it to the Oireachtas to pass legislation. The ballot paper certainly won’t explain the complexities of the issue to anyone but there are plenty of sources of information so read as much as you can. After all, it was being presented with the information that resulted in the CA and OC recommending the 12 week limit. Imagine if mammy decided to abort you? Yes and so was my daughter. And she was unplanned so I considered an abortion. After a discussion with my partner we decided that we would keep the baby. This is what adults do. And while I’m at it, I was also an unplanned baby, and guess what? My parents also had a discussion about whether to abort me. Obviously they didn’t, but if they had, I wouldn’t be alive or here to care one way or the other. I would have no sentience or consciousness so your point is completely irrelevant. Jaykers tonight! Yee Meadowlark women, wha’? Gerrup de yaaaaaard! ps David: see where being patronising gets you? I think it just kills some people that the person who actually has to go through the pregnancy and give birth should have control over whether she does it or not.